How old will you be on Friday 13, 2029? That is how old you will be when a large asteroid (1) ____ very close to our planet. 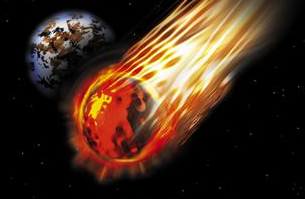 Asteroids are (2) ____ that circle the sun in space and sometimes come close to Earth and even hit it. Most asteroids (3) ____ small, and you can sometimes see them as 'falling stars'. Because they are so tiny, they do little or no damage to our planet. However, most (4) ____ believe one large asteroid, about 6 (5) ____ 12 kilometers across, hit the Earth and (6) ____ all the dinosaurs about 65 million years ago. Apophis is also big. Scientists discovered it in 2004 and they (7) ____ that it is about 300 meters across, large enough to destroy several cities. Most scientists (8) ____ that it will miss us by only 35,000 kilometers - that's (9) ____ than our moon which is about 240,000 kilometers away. But they are (10) ____ 100% sure. And the same scientists say that it (11) ____ return to Earth on April 13, 2036. Will Apophis miss us again in 2036? Or will it hit us? Again, no one is sure. The only sure thing is that all the eyes and telescopes (12) ____ every country of the world will be watching the night sky on April 13, 2029, and on April 13, 2036.